Do your children ENJOY learning from the bible at home or at church? Do they *GROAN* when you stop telling the story because they want more? Do your children “know” the Bible?…Or do they “understand” it? 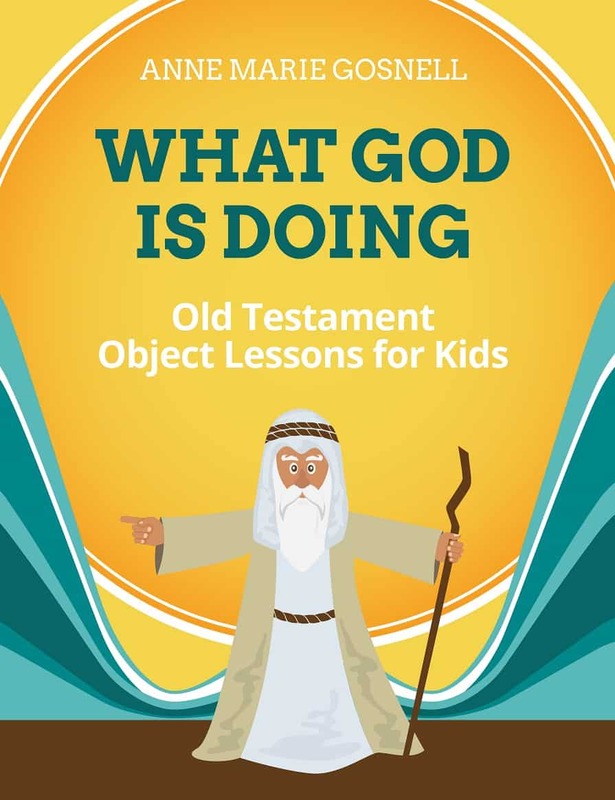 What God is Doing: Old Testament Object Lessons for Kids includes 26 interactive Bible object lessons that create a fun learning atmosphere while teaching Biblical truth that enhances spiritual growth. 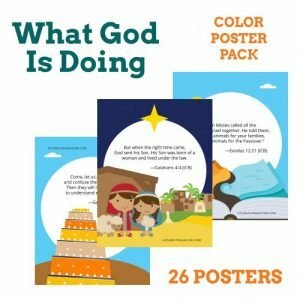 Perfect for Sunday School, Awana, small groups, and other Children’s Ministry activities. It’s time to ENGAGE our children using Bible Lessons that ENHANCE spiritual growth and EXPAND the kingdom! Discover why the Old Testament is so important. Many adults do not know where biblical people fit into the entire scheme of the Bible and why God does what He does. There is a generation of biblically illiterate people in our churches. Do you want the children you teach to be biblically illiterate? The Old Testament depicts how God began to bring about His plan of salvation. God worked through imperfect people and used a nation as a channel to provide a way of salvation for all mankind. Children will not understand why Jesus is such a BIG DEAL until they understand why what happened in the garden of Eden is a BIG DEAL. 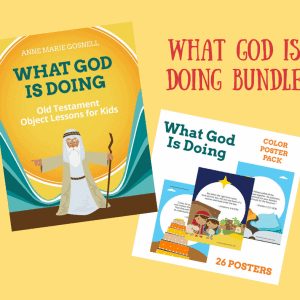 What God Is Doing, Old Testament Object Lessons for Kids by Anne Marie Gosnell. Build family relationships as you discuss biblical history and truths with your kids. Teach your children the Old Testament by using critical thinking questions and hands-on lessons. I love the kinesthetic approach that is presented to help children grasp abstract concepts. The object lessons use easy to find items, easy to complete, as well as a great visual for children. This book is a great resource for anyone (from the homeschool parent to workers in Kid Ministry) who teaches Bible to children. One of my favorite lessons from this book is about the tower of Babel with the language cards. My children like to ask me to google how to say different phrases in other languages. This lesson helped my children to understand the importance of why we should learn other languages so that we can share the Gospel with others from around the world. I can’t wait to share more of the lessons from this book with my children. 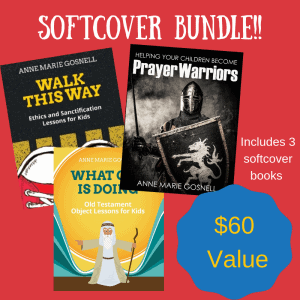 Once again, Anne Marie has written an amazing resource for both Children’s Ministry and parents who want to be intentional about passing on their faith to their children. This book covers events from the creation of the world to the time of Jesus. I love the extra section in the back about how to become and excellent Bible teacher. One of her tips includes making sure to let kids know that these lessons are more than just stories — they are history. They are true accounts. I love this hope that more Children’s Ministry leaders make it a point to remind kids that the things in the Bible are actual events that took place. Each lesson contains a bit of background, an object lesson, a more in depth Bible lesson and life application. You can also get coordinating posters from her website. One of my favorite things in this book is the number of object lessons that use legos or building blocks. As a mother of kids who are obsessed with legos, I’m so happy to find a resource that already plays into that interest. I love that this includes lessons that are often missing in Children’s Ministry curriculum such as the divided kingdom (and the importance of leaders who love God), Zerubbabel rebuilding the temple and even a lesson on the dangers of marrying people who do not share your faith. I love the balloon object lesson for “Between the Testaments” — it really captures the tension of waiting for something for a long time. This book is a clear winner. It is perfect for the classroom and would make wonderful memories if used within the context as a family as well.